Now that the iPad is here, and everyone who waited in line has one in their hands, the opinions are coming in from actual consumers and everyone else. All of this iPad mania is splitting people into two even camps: either you are one of the few who is lovingly stroking one in your hands right now (or wish you were), or you don’t get what the fuss is all about and just want to stop hearing about the stupid iPad. 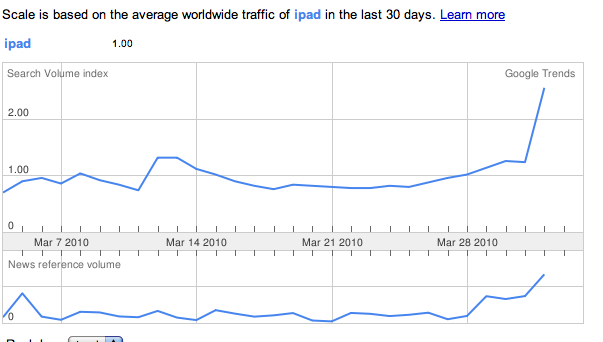 If sentiment on Twitter is any guide, people Tweeting about the iPad either love it or hate it. And the haters are a slightly larger group at 51 percent. TweetFeel is showing 59 percent positive Tweets rights now. 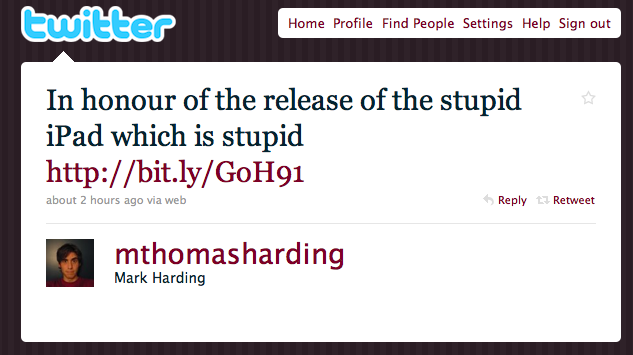 Most of the positive Tweets are along the lines of “Man, this iPad is sweet!” or wishing they had got one today. OMG! SHUT UP ABOUT THE FRIGGEN IPAD ALREADY! The iPad is so stupid, apparently, the guy had to make a comic about it. Oh well, love it or hate it, everyone’s still searching for information about the iPad it seems (it is also a trending search term on Google).